The Jokkmokk Winter Market has a long history. In fact, it celebrates more than 400 hundred years of unbroken tradition for the Sámi people. You see, the Swedish monarchy established permanent marketplaces near the Sámi winter settlements way back in 1605. The Jokkmokk Winter Market officially opens on the first Thursday in February and it attracts tens of thousands of visitors from around the world. It’s the premier meeting place for the Sámi people from across the entire Sápmi region of northern Scandinavia. There are pre-opening festivities, too, and that’s what we’re gonna explore. Sound good? Terrific! 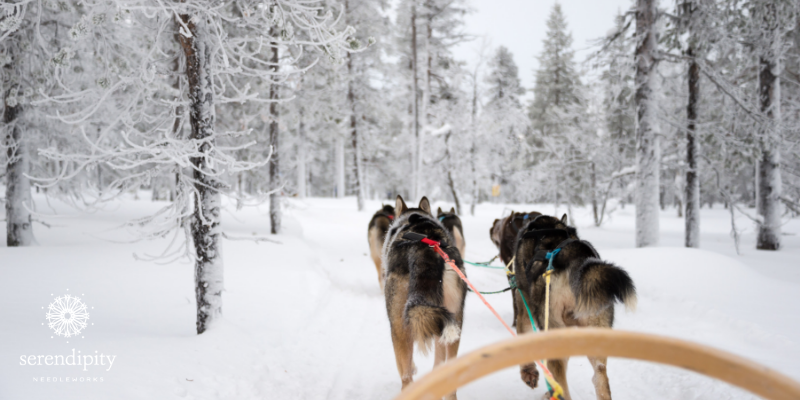 Dog sledding is a popular winter activity for natives and visitors – and when crossing roadless territory, it’s sometimes the only mode of transportation. Whether crossing over frozen lakes or through snow-covered forests or mountains, it’s great fun sledding with these energetic furry friends like the one you see in the picture below. 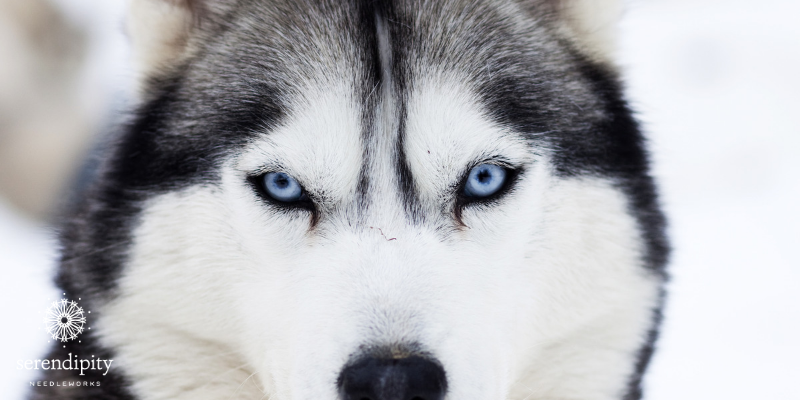 Isn’t he a beauty? especially when you use tweedy wool thread. 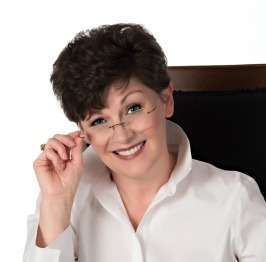 It’s super easy to execute – and it’s also easy peasy to compensate. The interlocking Gobelin stitch one of those stitches that you can always count on and it’s a terrific choice for beginning stitchers (or if you’ve been away from needlepoint for a while). You should always work each stitch from bottom to top. Follow the numbers on the stitch diagram above and you’ll be golden! The back of your work will vary from row to row, with every other row looking the same, but that’s okay. This is an exception to the “rule” that you should have as much thread on the back as you do on the front for satin stitches (to ensure the best coverage). Interlocking Gobelin is a slightly directional stitch, depending upon which way you slant your stitches and it suggests a wee bit of movement. It’s a smallish stitch so it’ll fit in just about any space. I’m using Alpaca 18 to work the interlocking Gobelin stitch. Alpaca 18 is a 100% alpaca thread that’s comparable in size to DMC #5 pearl cotton. It works best on 14 – 18 mesh needlepoint canvas. There are 17 natural (i.e., un-dyed) colors of Alpaca 18 and each card holds 12 yards. It’s an incredibly soft thread, so use shorter pieces (16″). Remember to move your needle along the length of the thread as you stitch. That will keep the eye of your needle from damaging it. 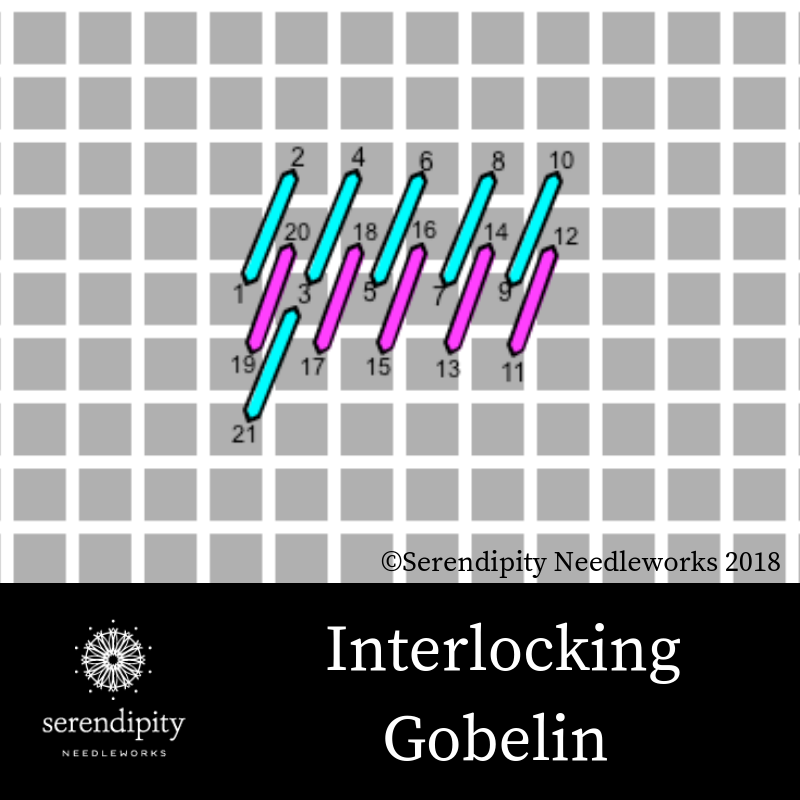 Use the stabbing method to work the interlocking Gobelin stitch. What’s the stabbing method? Great question. It’s where you come straight up through the canvas and take your needle to the back straight down through the canvas. And be careful not to drag your thread along the surface or pull it at an angle. I’m using one strand of Alpaca 18 (AL61) in a #22 tapestry needle to work my interlocking Gobelin stitch sample on a piece of 13 mesh needlepoint canvas. You could also use Bella Lusso to work this stitch. Use 4 – 5 strands on 13 mesh and 2 – 3 strands on 18 mesh. 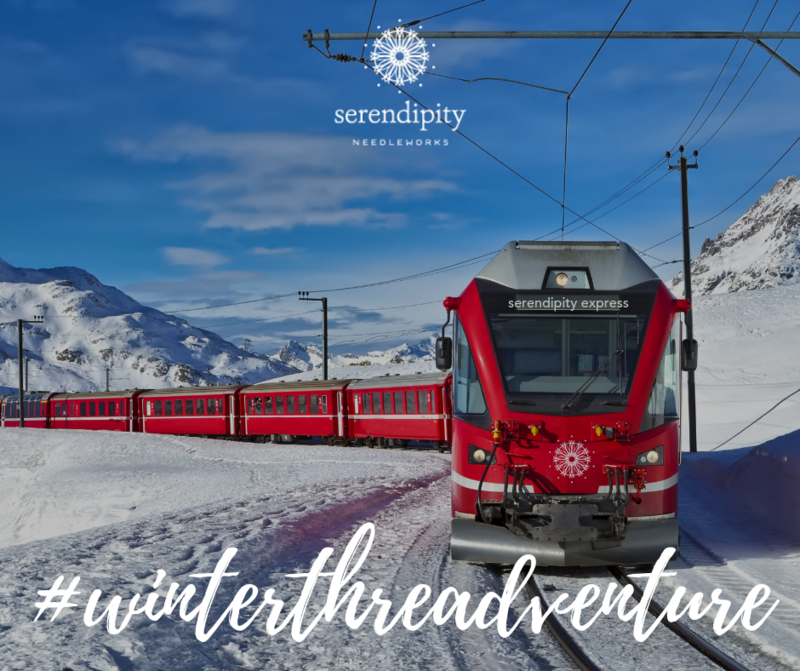 using the special 2019 Winter Threadventure hashtag – #Threadventure2019. And if you want to take a peek at our other destinations, click here for week 1. Then, click here for week 2 and click here for last week. Don’t know how to use hashtags? No worries… just take a peek at my Instagram feed for an example. Alrighty – that brings us to the end of our visit to Jokkmokk. Thank you for your question. I’m happy to help. I’d be glad to take a peek at your kitty canvas to give you my recommendation for which thread to use for the kitty’s face if you’d like. You can snap a picture and send it to me at [email protected].